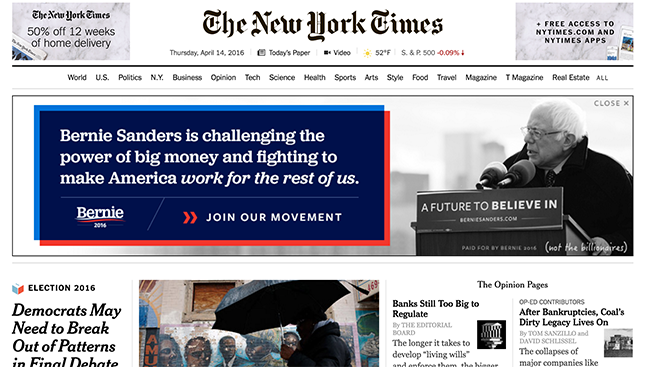 Bernie Sanders is running a desktop takeover ad on The New York Times' website through midnight as the Democratic presidential candidate readies to battle Hillary Clinton in a debate in Brooklyn tonight. It's the first time the Times has given the digital space to a political candidate for any race, a rep for the newspaper said via email. It's unclear why Sanders got the premium space before any other candidate. Adweek asked the Times for a clarification but hasn't received an answer. It would appear to be a change in policy, however. Otherwise, it could be accused of favoritism in the contested race—though the paper endorsed Clinton as the Democratic nominee at the end of January. At the same time, it's hard to imagine that no other political candidate has asked to buy the ad unit. Clinton reps didn't immediately respond to requests for comment via email or phone. The ad was purchased by Washington, D.C.-based Revolution Messaging, which is handling digital media for Sanders. Clicking through on Sanders' ad takes users to a page where they can select the political issues that interest them most—racial justice, campaign finance reform, etc.—and join the campaign's email list. When the form is completed, users are taken to a donations page.